Our biggest annual fundraiser is just around the corner on April 13. Here's your sneak peak into what our live auction has in store for you. Get ready to bid on exciting packages full of world-class adventure destinations, once-in-a-lifetime opportunities, and some of the best gear in the business! Each year we celebrate and support our Mountaineers community at the annual fundraising gala. And, each year the auctions are packed full of spectacular packages. Here's your sneak peak into what our live auction has in store for you. Get ready to bid on exciting packages full of world-class adventure destinations, once-in-a-lifetime opportunities, and the best gear in the business! Enjoy two nights and three days in a deluxe waterfront cabin on the north shore of Lake Wenatchee in the heart of the Cascades! This incredible home sleeps up to 12 people and comes fully equipped with a gourmet kitchen, fireplace, ping-pong table, private dock, kayaks, and a canoe. In addition to these fabulous amenities, you’ll have access to many beautiful hiking trails, including day trips into the Enchantments. In the winter, you can explore the beautiful landscapes on snowshoes or visit Stevens Pass for a day of skiing. Looking for some tasty eats? Leavenworth is just a short drive away for some Bavarian-style fun! Small car? Tons of gear? No problem! Attach your 5-day Rack N Road rental of either a rooftop cargo box or mounted bike rack and choose your own adventure. And don’t forget your new Patagonia Black Hole Duffel and Pack for easy travel and YETI Tundra Haul cooler to keep your beverages cool on the dock! Valid for Friday-Sunday night use, please arrange for a mutually agreeable date by March 2020. Where better to enhance your nature photography skills than beautiful Jackson Hole, Wyoming? From September 22 – 27, 2019, you can hone your photography skills with top nature photographers and editors—many from National Geographic. 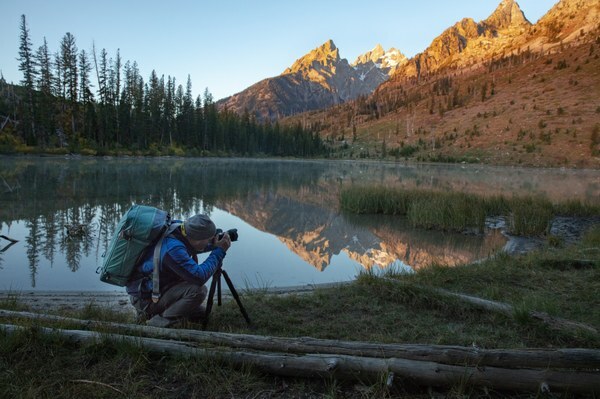 Summit Workshops offers a wide-array of knowledge—ranging from expert advice, professional mentoring, and technical assistance—all set in the beautiful landscape of the Grand Tetons. This is the very place where Jimmy Chin once shared his photographic acumen as an instructor. While many nature workshops provide you with an opportunity to shoot outstanding nature photos, Summit Workshops takes it one step further by offering you a suite of techniques including: composition and nature photography, conservation in photography and photojournalism, social media and marketing, and much more. Maybe you’ll meet the next Jimmy Chin! In addition to the photography workshop, the beautiful Snow King Resort will host your deluxe five-night stay, putting you a few blocks from downtown Jackson, minutes away from Grand Teton National Park, and steps from Snow King Mountain. Amenities include: airport shuttle service, 24-hour fitness center, outdoor pool, hot tub, and onsite restaurant and bar. So, if you’re serious about taking your photography to the next level, or just looking to advance your hobby while spending a week in Jackson Hole, get your bid card ready! This package is for one person. Workshop takes place Sept 22 - 27 and not available to exchange. Airfare will need to be secured separately. Enjoy a five-night stay for 6 people at Windigo Lodge, located on the western flanks of the Tetons, just above Victor, Idaho. (In other words, “Wydaho”!) 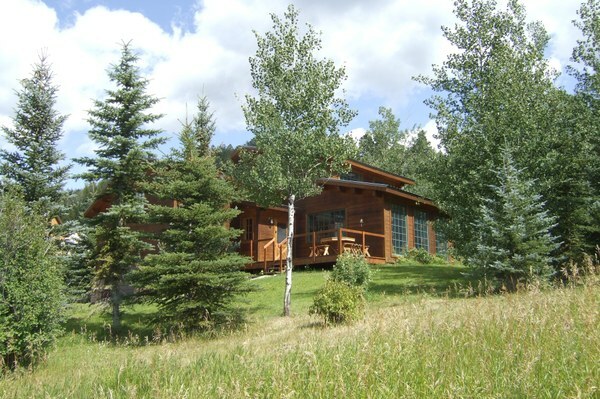 This private, family-owned lodge offers all the modern conveniences with the best of rustic feel. It comfortably accommodates six outdoor-loving visitors in two bedrooms, two bathrooms, and a queen-plus sofa-bed in the "great room." Jackson Hole is only 22 miles to the east, and Grand Targhee Resort just 24 miles to the north. Grand Teton National Park is just an hour and a half drive away, and Yellowstone National Park only a half an hour further. Or just "stay home" and take a wildlife walk right from the Lodge up the Game Creek Drainage, continuing, if you like, on an epic hike into the Jedediah Smith Wilderness. At the end of the day, barbecue on the back deck and finish with a relaxing soak under the stars in the private hot tub as you contemplate the next day’s activities. Ready to take your Tetons adventure to new heights? Jackson Hole Mountain Guides will provide you with a guided climb for two to experience good rock and great scenery. To outfit your adventure, be sure to fill your new Gregory Quadro Hardcase luggage with your Petzl Volta 60m rope, Sirocco helmet, three SMD carabiners, and your Rab Mircolight Alpine Shell and Nucleus Fleece. Please arrange for mutually agreeable dates in the Spring or Summer of 2020. Airfare will need to be secured separately. Take home a piece of mountaineering history! 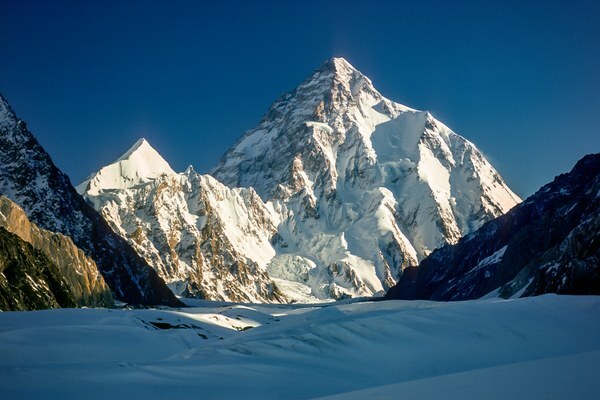 On September 6, 1978, Jim Wickwire and Lou Reichart became the first Americans to stand on the summit of K2. Soon after, John Roskelley and Rick Ridgeway summited as well. They all did so as part of a team-effort, led by the legendary Jim Whittaker, to climb the world’s second highest peak and widely considered to be the most dangerous. It was a truly remarkable feat and now is your chance to honor the accomplishment. 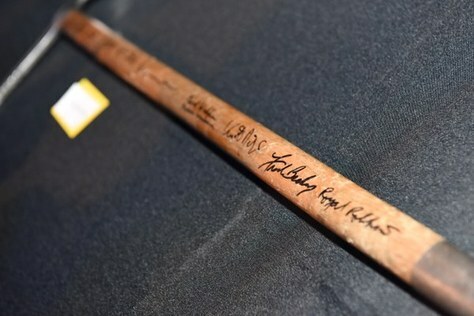 This commemorative REI Co-op ice axe has been signed by eleven of the original team members, including: Jim Whittaker, Louis Reichardt, Rick Ridgeway, John Roskelley, Jim Wickwire, Craig Anderson, Terry Bech, Diana Crist, Skip Edmonds, Dianne Roberts, and Bill Sumner. In addition to the axe, you will also be taking home three of Dianne Roberts’ photography prints from the expedition—all signed by the eleven team members. TSUGA Fine Art and Framing will then professionally frame these prints for you to preserve their provenance. Last September marked the 40th anniversary of the expedition, bringing the team back together again for a once-in-a-lifetime celebratory event at The Mountaineers Program Center. We couldn’t have been more thrilled to host this iconic team—and to host a few of them at the gala. Just imagine, you could get a picture with them and your newly won ice axe after the event! Mike Gauthier was a climbing ranger for Mount Rainier National Park for 19 years. During that time, he summitted Washington’s most famed mountain more than 180 times. While at Rainier, Mike also managed the Search and Rescue program and was directly involved in more than 150 major searches or rescues. Mike is also a Mountaineers Books author, having written the definitive climbing guide to Mt. Rainier, now in its third edition and a best seller. In 1998 he was recognized as a Wilderness Rescue Hero by the American Red Cross and in 2004 Men’s Journal named him one of the 25 toughest men in America. 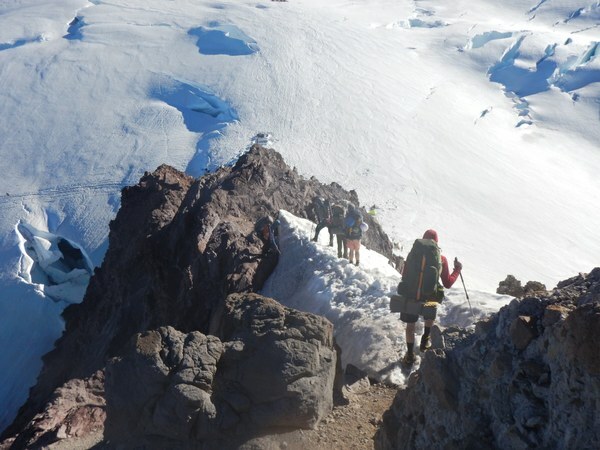 This package is a buy-in opportunity to Mike Gauthier and Mountaineers CEO, Tom Vogl, on July 11 – 14, 2019, as they lead you and five other adventurous package winners to the top of Washington’s highest peak via the Emmons Glacier Route. Mike and Tom will co-lead this trip with an all-star group of Mountaineers climb leaders and Board members: Rich Draves, Brynne Koscianski, Steve McClure, and Sherrie Trecker. This will be a once-in-a-lifetime journey with much camaraderie on the trails and much storytelling at historic Camp Schurman. This will be an unforgettable accomplishment to take part in, so don’t miss out on the opportunity! Participants will need basic climbing, glacier travel, or winter scrambling experience to participate. If someone is close on experience but unsure, don't worry - we can work with you ahead of time for some additional training. Get ready for the trip of a lifetime. Stay in the cozy climbers apartment at Steve Swenson’s winter home in Canmore, Alberta—approximately 50 miles west of Calgary near the southeast boundary of Banff National Park. A veteran climber with an ascent of K2 and a solo ascent of the North Ridge of Everest, Steve will spend two days ice climbing with you and a partner, bringing you to all of the best climbing areas. After a long day of climbing, enjoy a relaxing evening with Steve and his wife Ann over a home-cooked meal and a glass of wine. Steve Swenson is a remarkably accomplished alpinist and a recipient of the prestigious Piolet d’Or for his and his teammates’ first ascent of the world’s second-highest unclimbed Mountain. To outfit this trip, Arc’teryx will be supplying you with a top-of-the-line insulating layer, an Alpha Goretex jacket, and an Alpha AR 35 climbing pack. 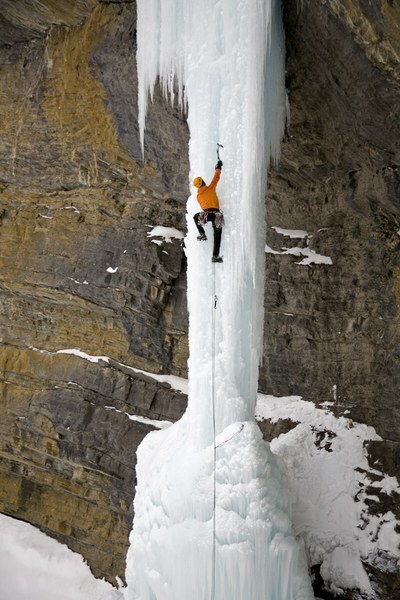 Black Diamond will be contributing top-of-the-line ice climbing gear. Banff Park Lodge will also be providing a $75 gift card for food and beverage at their La Terrazza restaurant. Lastly, United Airlines will provide you with two airline tickets, good for direct and easy travel to Calgary (restrictions apply). Please arrange for a mutually agreeable date. Must use by March 2020. Travel to and from Canmore is not included. Enjoy a six-night adventure on the eastern slope of the North Cascades in Mountaineers CEO Tom Vogl’s deluxe cabin. With two bedrooms and a cozy loft, this adventuresome outdoor getaway comfortably sleeps 6-8. 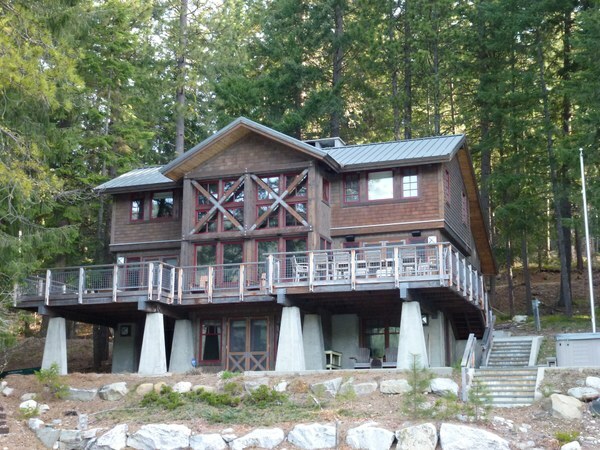 Located in the heart of Mazama Valley near Mazama, this is the ultimate package for your outdoor adventure. 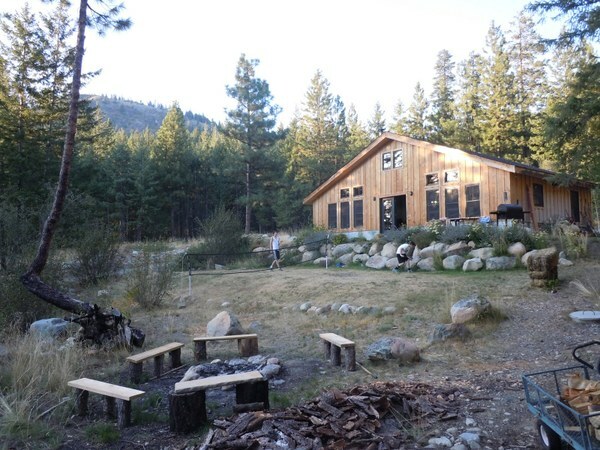 You’ll have access to premier mountain biking or backcountry skiing with rentals for two (mountain bike or backcountry skis) from Goat’s Beard Mountain Supplies in Mazama. You will also get to experience the North Cascades from up high! North Cascades Mountain Guides will take you and a partner out for a day of climbing on the Mazama rock. After you are done working up a sweat you can hit the town for dinner at a local favorite, Arrowleaf Bistro in Winthrop. Please arrange for a mutually agreeable date. Must be used by March 2020. North Cascades Mountain Guides must be booked 30 days in advance; services are available in spring, summer, and fall. Looking for a break from the Pacific Northwest rain? This sunshine-filled package is for you. 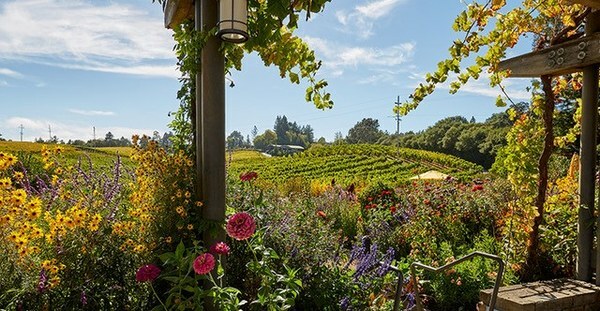 It starts with a peaceful 4-night stay at Martha Kongsgaard and Peter Goldman’s Napa guest home, fully equipped with a big kitchen, spacious great room, swimming pool, and one large bedroom and bathroom – all of this located on a vineyard! In addition, Alaska Airlines will provide you with two coach airline tickets, good for direct and easy travel to Napa. Supplementing the rest of the trip, relax and unwind with 4 rounds of golf at the Chardonnay Golf Club, a dining experience for two at the Michelin star-rated Auberge du Soleil, wine tasting for two with Wine Road, and a locally-sourced dinner for two at PRESS Restaurant. To top it all off, you will take in breathtaking views of Napa’s world-class vineyards during an unforgettable hot air balloon ride for two with Balloons Above the Valley. It is the perfect getaway for hillside vineyards, gourmet food, and high-end relaxation. Please arrange for a mutually agreeable date. Must be used by April 2020. Airfare can be used to secure flights anywhere Alaska flies in North America (restrictions apply). Sitting 21,000 feet above the sacred Ganges River in Northern India, the Shark’s Fin on Mount Meru remained unsummited for millennia and beaconed some of the world's toughest climbers. Then in October 2011, Jimmy Chin, Conrad Anker, and Renan Ozturk became the first team to complete this highly sought-after goal. The feat was historical, including a journey through nature’s harshest elements and dramatic setbacks. If you’ve seen the film MERU, you’ll know Jimmy Chin captured it all. 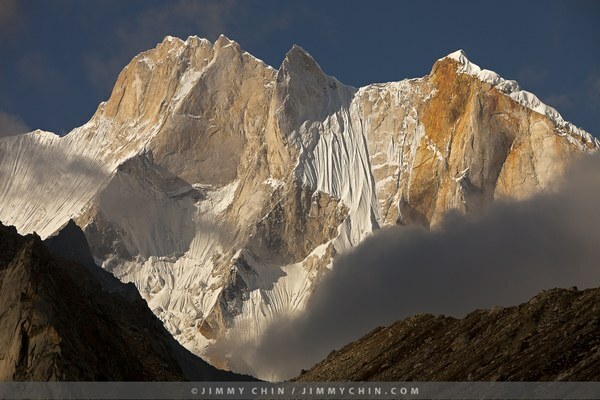 Our event is your once-in-a-lifetime opportunity to celebrate this achievement in mountaineering history by taking home an original Jimmy Chin photograph of the Shark’s Fin. This is a 16x24 inch print on archival paper that also includes a $400 framing gift certificate to TSUGA Fine Art and Framing to have this beautiful image professionally displayed. Immediately following the evening's program, you’ll have the unique opportunity to meet Jimmy and have your print personally signed. Who knows, you might just get a photo taken with him and your new keepsake as well. This evo adventure to Chile means you’ll get to ski and snowboard on active volcanoes, explore waterfalls, dip in hot springs, and, after it all, unwind at the beautiful Rocanegra Mountain Lodge & Spa. You’ll be among the tallest mountains in South America—the Andes—and experiencing some of the most exciting terrain, deepest snow, and best skiing and snowboarding you can find during August (remember, it’s going to be winter down there!). You’ll then top your days off with amazing sunsets, scenery, delicious food, fine local wine, and a new-found love of Chile. You’ll also be with great company, joining a group of other evo participants who will become your close friends by the end of this seven-night outing. This is because evoTrip adventure vacations are more than just an opportunity to travel to remote places in search of your next adventure, they are the most immediate way to experience the blend of both sport and culture. By travelling with evo you will gain new perspectives while doing something you are passionate about in an extraordinary landscape with extraordinary people. This trip for one person includes: - Transportation by private coach from the airport to Rocanegra Lodge and from Rocanegra back to Santiago. - Six nights stay at Rocanegra Lodge and one night at a hotel in Santiago (two people per room). - All breakfasts and dinners at Rocanegra Lodge. - Five lift tickets at Nevados de Chillan. Must be booked by August 2020 for an existing evoTrip adventure. Airfare must be secured separately. In preparation for the trip, Helly Hansen will also be outfitting you with elite gear to make you the envy of the group. This includes a top-of-the-line pant and jacket shell, a jacket insulator, and a base layer. Spy Optic will also be supplying you with collector’s edition goggles and Sealskinz with extreme cold weather heated gloves. The twenty-day trek to Mount Everest’s base camp is consistently ranked as one of the top five outdoor adventure experiences in the world. There is no better way to experience natural Himalayan majesty and Nepalese culture than to follow the iconic Khumbu Valley to Everest’s base camp—and now is your chance to take the journey with one of the best outfitters in the industry, Madison Mountaineering. 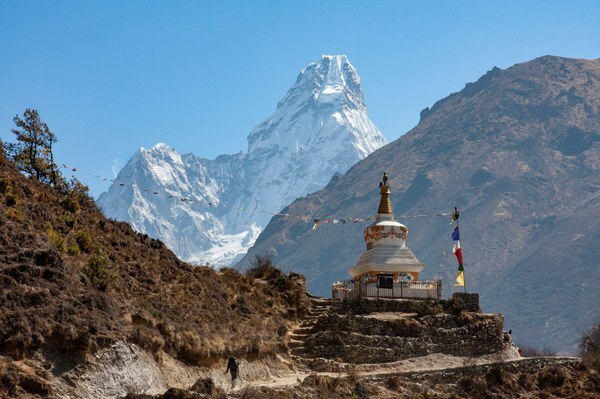 It starts with an exciting airport landing at the mountain village of Lukla and continues with the 10-day trek to Everest, offering views of soaring peaks, flowing river valleys, and the mighty Khumbu glacier. You will not only be following in the footsteps of countless climbers who have sought the summit of Everest, but you will also be accompanying Madison Mountaineering’s 2020 Everest expedition team. The time spent together with these fellow trekkers, climbers, and guides will provide ample opportunities to share stories while at welcoming teahouses and build lifelong friendships. This package for one person includes accommodations in Kathmandu where you will tour several UNESCO World Heritage Sites, round trip airfare from Kathmandu to Lukla, park and porter fees, and all accommodations and meals while on the trek. In addition, you will be outfitted with Madison Mountaineering logo’d gear, including a Mountain Hardwear Ghost Whisper jacket, Hydro Flask bottle, buff, and hat. Approximate dates for 2020 are: April 2 - April 18. Please make reservations with Madison Mountaineering by July 12, 2019. Package does not include: Travel outside of Nepal, personal equipment, meals in Kathmandu, bottled beverages while trekking, upgrade to single room accommodations, costs for helicopter transports, costs for early departure from program, or gratuities. This year we have 56 incredible packages in our silent auction, all thanks to our generous donors. Here are 5 examples to get you excited! In 1953, Sir Edmund Hillary earned the world’s attention by becoming the first person to climb Mount Everest. 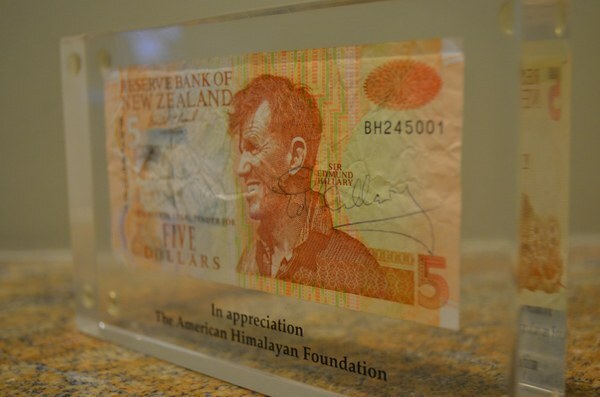 To honor the accomplishment, New Zealand’s five dollar bill now proudly displays his portrait. On April 13th you can take home one of these rare signed notes from when Hillary visited Seattle in 1996 to attend a dinner hosted by the American Himalayan Foundation. It’s the perfect collector's item for anyone celebrating mountaineering history. 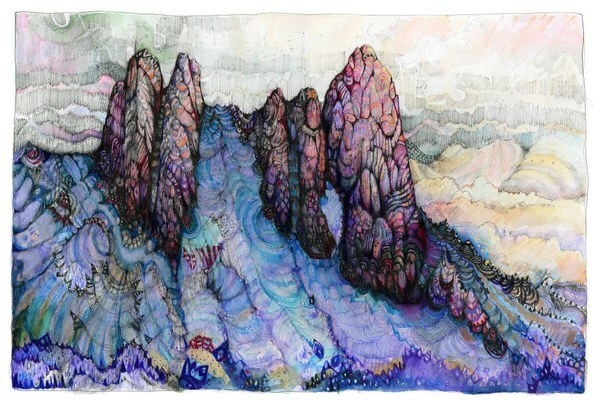 Craig Muderlak is a Mountaineer and internationally recognized artist whose work has been featured in such publications as Alpinist, American Alpine Journal, and Climbing. Muderlak’s abstract landscapes evoke deep emotions for the places we love, like this original framed illustration of the Liberty Bell Group located in the North Cascades. Sea to Summit has engineered a state-of-the-art sleep system designed specifically for the needs of women—and now is your chance to take home all four items in one purchase! This includes an Aeros Down Pillow, Adaptor Coolmax Sleeping Bag Liner with Insect Shield, Journey JoII Women’s Down Sleeping Bag, and Women’s Comfort Light Insulated Sleeping Mat. 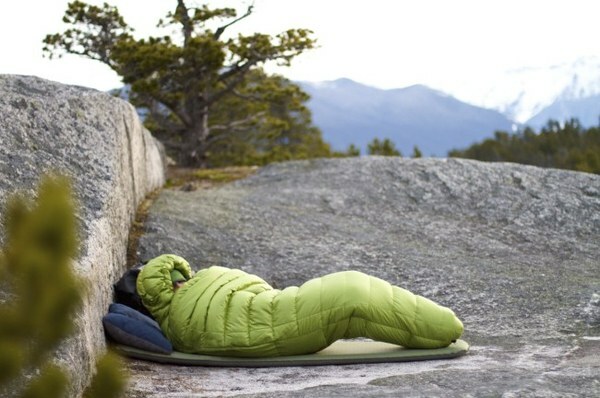 Prepare to sleep like a queen in the wild! Do you want to get your kids outside this summer, but you’re not sure where to go? 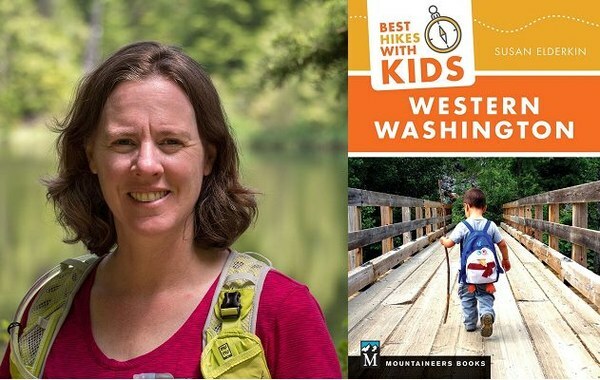 Susan Elderkin, author of Mountaineers Books “Best Hikes with Kids: Western Washington” is here to be your Hiking Concierge! Host Susan at your own home with all of your friends and she will consult with you about your family’s interests, skills, and motivation levels, then put together a personalized plan for day hikes and/or summer vacations in Washington. With two children of her own, she knows how rewarding it is to see the kids light up with discovery when hiking our big backyard. This package includes a copy of Susan’s book and a Deuter Kid Comfort pack, designed for ease and safety on both long and short hikes—a true favorite of parents and kids alike! 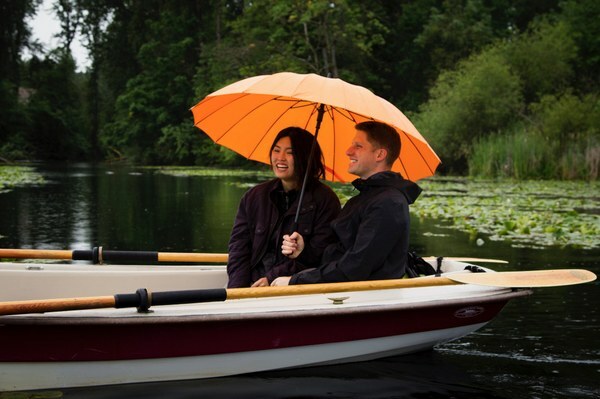 Embark from North Lake Union on a journey in a rowboat crafted perfectly for two guests. Relax while Mountaineers Books author Jordan Hanssen rows you on a voyage through a city best seen from the water. Discover the colorful history of the unique geography that shaped the people who call this home and how they in turn reshaped the land. Travel past adorable houseboats and under spectacular drawbridges to wetlands teaming with life and only accessible to human powered craft. Enjoy light refreshments, conversation, adventure stories, and bird watching. On the return take the opportunity for a rowing lesson or just sit back and enjoy the Emerald City to the sound of oars dipping quietly in the water.